That was the last Christmas that my whole extended family was together. My aunt died a few weeks later, and it was like knocking out a key stone: the rest tumbled after. I know I’m late to the party, but I’m very sorry for your loss, Ryan. My husband’s dad died around the holidays, and so it’s never been the happiest time for either of us. All we can do is look to each other for warmth and comfort…and keep our sanity between family gatherings. 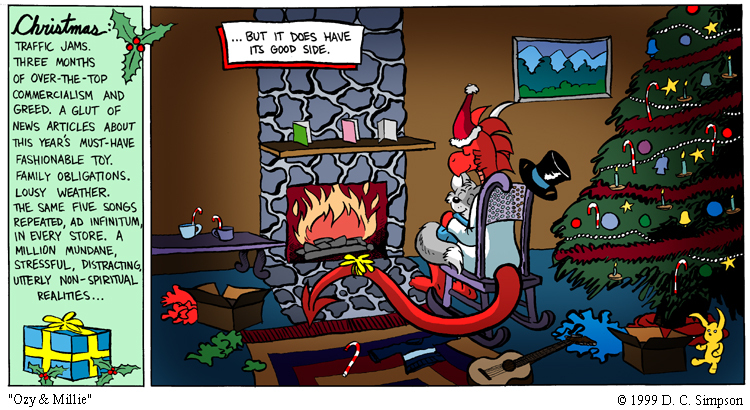 This reminds me of the beautiful Calvin and Hobbes christmas strips. I love Ozy & Millie. The 12 Pains of Christmas does have a point…but there is a flip side. The Christmas tree looks like it doesn’t have a stand…knowing Llewellyn, he probably made a hole in the floor and planted it there. Now that you mention it, that *does* look like what he did! and wrapped a blanket around the trunk to mask the hole.